What do you do when an old friend begins having accidents in the house? Sometimes the problem can be traced to more than one cause. Our 11-year-old Lhaso Apso is urinating all over our new house, frequently in small amounts and especially at night. My wife is taking him everywhere she goes now, giving him lots of attention, and ensuring that he has plenty of potty time. Initially, I thought his problem was due to the new lack of an accessible dog door in the new house. However, after doing some reading, I assume the problems include: recent cross-country move, his recent boarding for one month while the new house was delayed in preparation, my recent deployment (and I'm assuming sense of anger and abandonment) and perhaps a sense of desire to mark his new territory. However, his problem is not completely new. He used to urinate nightly on our hardwood floor, especially if we forgot to take him for a night walk. Only when we would give him lots of attention would he avoid these "accidents". Neutering him several years ago only helped for several months, then his poor habits recurred. What are your recommendations for this old dog that we love so much, but that has so many potty incidents in the house when we are not completely showering him with attention? Should we give him up to someone who can spend more than two hours of undivided attention per day with him? I'm sorry to hear your dog is having a difficult time making the adjustment to his new living circumstances. However, I would not recommend giving him away to anyone else. Senior dogs may take a little extra care, but they are certainly worth it after all the years of love and devotion they have shown to us. The recent upheaval in your personal life could certainly play a role in your dog's current problem, but I don't think his problem is completely behavioral. Urinating frequently in small amounts can be a sign of kidney disease or a urinary tract infection. Your dog might actually have kidney stones blocking him from fully relieving himself at times. When this happens, the pressure builds up in the bladder until more urine is forced out. I highly recommend that you schedule an appointment for your dog with your veterinarian. Your vet will do a complete work up on your pet, as well as give him a physical examination. This will reveal if your dog has any medical issues that need to be addressed. In the meantime, you can address the house accidents by purchasing a belly band for your dog. This is a type of doggie diaper for males that keeps them from urinating in the house. Our own guest columnist Wendy Nan Rees is using them with her dogs, and she likes them. You can do a quick Internet search to find websites that sell them. Thank you for your question, and I hope you find these suggestions helpful. My 11-year-old Terrier is diabetic, and has always been anxious during thunder storms. However, he has recently started to tremble for no apparent reason. He also wanders from room to room continuously, and he cries to go outside at night and will then sit outside for 20-30 minutes at a time and then urinates inside. He continues this every hour or so, As you can imagine, this is extremely frustrating/tiring as I have a full time job. This behavior began two months ago, and the vet prescribed diazapam, which I gave the dog for about a week. However, it had little success and the behavior stopped on its own after approximately four weeks. It suddenly began again two days ago and I would welcome any help you can offer. I'm sorry to hear that your dog hasn't been well. As diabetes progresses, it can cause an accumulation of problems. However, considering your dog's advanced age, we also need to look at geriatric issues as well. 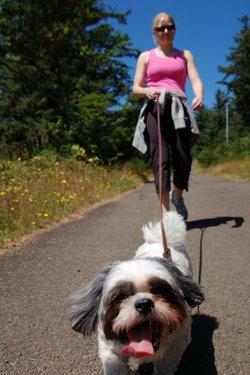 Failing vision: This could be attributed to the diabetes, and would make it more difficult for your dog to see at night. In turn, this could make him feel more isolated, vulnerable and anxious which could result in the crying. Your dog might also be experiencing periodic cognitive dysfunction, typically referred to as senility. Some senior people experience a type of dementia referred to as "Sun downers" which appears to be triggered by the setting sun. Perhaps your dog has a variation of this syndrome? Whatever the cause of the recurring nighttime restlessness, I think you should talk to your vet about it again and find out if a slightly higher dose of diazapam/valium would be helpful in this situation. You certainly need your rest too. Thank you for your question, and I hope you are able to find some relief. I admire you for working so hard to help your old friend. In the past month I adopted a ten-year-old Lhasa Apso mix that had previously lived with a geriatric owner who utilized a combiniation of dog walking services and pee-pads to allow the dog to relieve himself. If we take the dog out frequently, he does not have accidents. However, he does not seem inclined to let us know that he needs to go out. I have not heard him bark, so getting him to communicate by "speaking" does not seem to be an effective choice. How do I get him to communicate his need to go out? Congratulations on adopting your new pet. That was a very kind thing to do. They say you can't teach an old dog new tricks, but I don't agree with this statement 100%. However, it is going to be difficult to retrain a ten-year-old dog. First, have you taken your dog to the vet for a check up yet? Sometimes senior pets begin to have health issues that result in increased house accidents. Your vet could check this out for you, and if your dog gets a clean bill of health, you can move on to training options. You're doing well by taking your dog out frequently, but have you tried teaching him a "potty" command? If you teach him to associate a word with the act, you can ask him if he has to go potty, and you should get some kind of a response. Remember, you've only had him for a few weeks, so it's going to take some time for you both to get used to the new routine. You might also consider providing the pee-pads in your home if this will help your dog avoid urinating in inappropriate places. Thanks for your question, and I hope this suggestion helps.